What are the import procedures in Ireland to move goods? Explain about import registration process, cargo movement to Ireland from overseas countries, Import delivery process in Ireland etc. How to import to Ireland? Detail the import methodology in Ireland. This post explains about step by step procedures that need to be finished with Ireland government authority for importation to Ireland. The Union Customs Code (UCC) is part of the modernisation of customs and serves as the new framework regulation on the rules and procedures for customs throughout the EU. The Operators are required to fill out an Entry Summary Declaration (ENS) to the customs of the country of entry, prior to the goods are brought into the customs territory of the Union, using the electronic procedure (Union Customs Code - UCC). Approved exporters, importers, or their agents can lodge their customs declarations through an automated data processing system called Direct Trader Input (DTI). Any delay in filing or absence of documents can delay the clearance process and thereby importer supposed incur demurrage on the imported cargo but also stand to loose business opportunities. 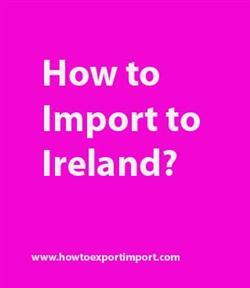 This post explains about different phases in import process that every importer needs to go through in Ireland. Explain to import to Derry. Information to import to BELFAST. Step by step process to import to CORK. Methods to import to DUBLIN. Guidelines to import to DUBLIN Please guide to import to BELFAST. Help to import to. Procedures required to import to Belfast. Requirements to import to Derry. Clarifications to import to CORK. How can I import to DUBLIN. What should I do to import to Derry. How to import to CORK? Formalities for import to DUBLIN. Procedures to import to WEXFORD. Need to import to Belfast.